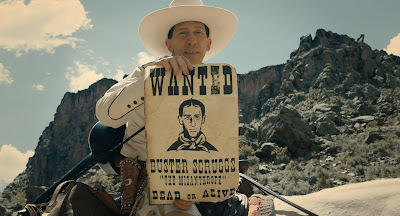 “The Ballad of Buster Scruggs”, a Western anthology of six short films written and directed by Ethan and Joel Coen, concludes with a passage in which five disparate strangers take a stagecoach to a frontier outpost as the light outside gradually dissolves into darkness, evocative of the movie’s ever-shifting emotional palette. Indeed, even as the characters inhabit archetypes with a comic twinkle, the specter of death hangs over everything, with frequent intrusions of grisly violence. That violence is at once sudden and inevitable, embodying the idea of the American West as a roughhewn place where men and women, cowboys and Indians, all kept moving even as they waited for the other shoe to drop. The anthology’s jarring shifts in tone are evident straight away as we meet the eponymous Buster Scruggs (Tim Blake Nelson) astride his horse, singing a song, guitar in hand, in some Monument Valley locale where The Coen Brothers have great editing fun, showing Buster up close with the song right in our ears, and then cutting to the singing cowboy from a distance with the song echoing off canyon walls, and even tucking a camera looking inside out from Buster’s six string. When he stops at a saloon and pulls his six shooter instead, that swell spell is quickly broken when he blows the fingers clean off his opposition. Yet Buster’s demeanor never changes, as if Gene Autry is starring in “The Wild Bunch”, never quite letting you get a full handle on your feelings, blending myth and veracity so artfully that you’re never quite sure which is which as it’s going down. And Buster’s concluding ballad is synchronously rosy and a requiem; you don’t laugh to keep from crying so much as just shake your head because you feel like doing both. The second story embraces laughter too, where one grave decision by a bank robber (James Franco) elicits an extended series of reversals pogoing from western motif to western motif, a hanging to an Indian attack and back again, as Franco goes through all this without hardly batting an eye, evincing that it’s all in a day in the life on the American frontier, uproariously brought home in a climactic punchline. Yet rather than end on this wickedly funny joke, the Brothers Coen pivot again, as everything, in one sudden cut to a point-of-view shot where everything goes black, pointedly rejecting the preceding story’s almost whimsical spirituality. That spiritual absence links it with the ensuing story, the anthology’s darkest, mostly, Meal Ticket, which is both wordless and full of words in following a grizzly impresario (Liam Neeson) cart a limbless reciter (Harry Melling) from town to town where he orates from the back of a covered wagon, like a prototype nickelodeon. If a few early moments suggest the impresario’s fatherly affection, the title betrays the truth, as does Neeson’s gravelly, incredulous, indelible chuckle at the short’s pivotal moment, a whole new world suddenly appearing before him, in an instant painting Manifest Destiny as the capitalist junk of a huckster. As a nameless Prospector, Tom Waits, despite his character being left virtually alone for the duration of his short, is not as silent as Neeson. No, the eccentric Waits acutely captures the eccentricity of a man who is his own company, as his virtual privacy out in the open merely underscores the vast emptiness of the American West. Yet that emptiness, a striking demonstration of location work, with a creek that truly appears untouched by all of mankind’s foul habits, evokes its own privacy, which the Prospector invades by digging it up in search for gold, his own footprint the violent turn in this passage as much as the actual violent turn. 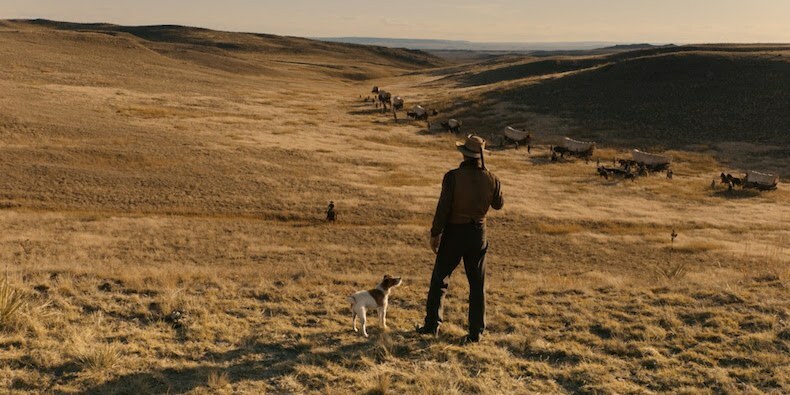 That notion of unwanted invasion deliberately bleeds into The Gal Who Got Rattled, the richest in terms of character, not least because it is the longest of the six, which allows us more time in the company of Alice Longsbaugh (Zoe Kazan), bound for Oregon by wagon train to be married off to someone she does not know at the behest of her aggrandizing brother. This storyline illuminates the anthology’s lack of female characters, as her entire existence is at the mercy of men, less a life lived than a series of business transactions where she is the product being bought and sold, which Kazan underscores with an overly humble performance emitting the pained air that she is always in the way. This short allows the most room for Native Americans, though even here they are seen from distance, “savages” of a war party, though their prevalence in this short above all others seems by design, a deliberate linking to The Gal Who Got Rattled herself, a people with too little say over their own fate. The most ferocious bullet in the entire movie is fired here, though we never see it, just the after-effects, which might well speak for the fate of Indigenous Americans too. The concluding passage, The Mortal Remains, with its five characters of varying professions and nationalities, is a summation of the previous five passages. If it begins with an homage to John Ford’s celebrated 1939 film, it gradually morphs into something more akin to the eternally terrifying silent “The Phantom Carriage” (1921), the neat trick of the light fading into a ghoulish green, which you only realize after it’s already begun to happen, like the light of your own life is dimming, receding, which the coach’s inherent claustrophobia clarifies. And when philosophical conversation grows touchy and a cry for the coach to stop is issued, it is not heeded. The driver never stops, it is explained, because that’s the policy, mimicking the passage of our own lives, rushing headlong toward some destination that we cannot know even as it proves identical for all of us, a familiar observation perhaps, but rarely conveyed with such eerie clarity. Hey Nick! Read a handful of your recent pieces just now. I don't have any specific comments except I continue to be benevolently envious of your prodigious talent. Looking forward to the imminent (?) posting of your top ten. I think I meant "benignly envious." Anyway, you know what I meant.